Callum Semple receives the plaudits after the match. Four tries for each side showed how evenly balanced this match was but it was Old Leamingtonians that came out on top by a point. From the kick off Shipston took the game to OLs and after only six minutes of play the home pressure and some untidy defence resulted in a try scored in the right-hand corner. The conversion was unsuccessful. From the restart OLs came more into the game but Shipston’s defence prevented any opportunities for the visitors until a well-judged cross-kick from stand-off Henry Reynolds caught them unawares and allowed winger Calum Semple to catch and cross the line for an equalising try. 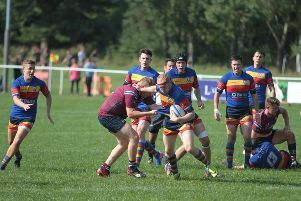 The conversion followed from Henry Reynolds to put OLs into a two-point lead. The advantage was short-lived, however, as the visitors fumbled the restart, allowing Shipston to take possession and gain ground into Old Leamingtonians’ 22. An infringement allowed the hosts to score a penalty to go 8-7 up. The game continued to ebb and flow before a sweeping move took OLs deep into the Shipston half. From well-won forward possession the ball was moved quickly along the three-quarters to find winger Semple in space and he crossed the line wide out on the left. Reynolds again added the conversion. Play was then dominated by Shipston and pressure on the OLs defence resulted in the home team scoring a pushover try that went unconverted to cut the gap to a point. From the restart OLs again spilled the ball, allowing Shipston to gain possession and finish the half with a further try to reach half-time with an 18-14 lead. 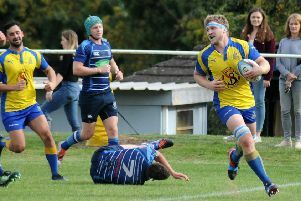 The second half saw Old Leamingtonians producing some first-class forward play and good running from the backs and it was only a matter of time before the pressure on the Shipston defence resulted in try number three for winger Semple. The ball bounced off the former colt’s chest after a downfield kick by Shipston and he chased it over the line for a touchdown. The conversion was missed but further pressure on the home defence saw man-of-the-match Semple receive a pass at the end of a quality backline movement to score his fourth try of the game and put OLs into a six-point lead with the game entering its final ten minutes. Some fractious exchanges resulted in a player from each side being sin-binned for ten minutes and the final period of play was dominated by Shipston who severely tested the Old Leamingtonians defence. Time and time again drives by Shipston were stopped short and good defensive clearances from full-back Oscar Heath and centre Ciaran O’Connor relieved pressure. However, Shipston finally crossed the line wide on the right well into injury time to move within a point of OLs. The kicker had the chance to bring his side victory with the conversion but his attempt sailed to the left-hand side of the posts.